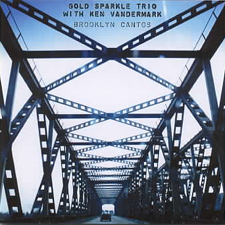 With one foot firmly planted in the avant tradition and the other boldly stepping into the future, the Gold Sparkle Band's newest recording, Brooklyn Cantos, unites them with kindred spirit Ken Vandermark for one of the first important jazz recordings of the new decade. Vandermark and the GSB members share similar sensibilities and influences, and their sympathetic interplay exemplifies the heroic conviction present in the heart of the finest jazz recordings. This is the third full length Gold Sparkle release on Squealer, following the widely acclaimed records NU*SOUL ZODIAC in 2000 and FUGUES AND FLOWERS in 2002. Liner notes on this release by Magnet columnist Bill Meyer. There's a palpable sense of adventure at play over the course of the four magnificent pieces on Fugues and Flowers, recorded at various venues during the band's tour of the Midwest in the late spring of 2000. The southern astro-funk of their previous album Nu*Soul Zodiac gets transmogrified into something deeper and more complex, as new ideas inform the music and allow it to expand outward. The band was always solid and well-rehearsed, but now the rhythm section has that rare intuitive quality, the compositions are complex, yet memorable, and the ensemble playing is exciting. GSB is capable of a driving muscularity, as they demonstrate on the powerful opener "Zodiac Attack", but they are just as comfortable with a gentle, melodic lyricism, as their excellent version of William Parker's "Holiday For Flowers" proves. The band reworks their older material with vigor, and attack the challenging new material with verve. Fugues and Flowers feels like a transitional recording, yet it's a powerful statement in its own right; if there's a transition taking place it's from excellence to transcendence. "Zodiac Attack" realized collectively by GSB (Nu Iron Music, BMI). "Second City Fugue" and "Motor City Fugue", from The Book of Future Fugues, composed by Charles Waters (Nu Iron Music, BMI), copyright 2002. "Holiday For Flowers" by William Parker (Centering Music, BMI). "Second City Fugue" recorded 4/27/00 at WNUR, Chicago. "Motor City Fugue" recorded by Jeff Rackley (spoons247@yahoo.com) at the First Existentialist Church of Atlanta 5/3/00. Thanks to T. Milton Jones and Euphonic Productions, Geoffrey M. Greenberg, Bethany Ryker, WRCT, Eric Weddle, Entropy Studios, Liz Copeland, WDET, Walt Davis, WXDU, Ross Grady, and the Immigrant Sons. Special thanks to Aubrey Pope, Janis Shen, Daniel Carter, Roy Campbell Jr., William Parker, Ken Vandermark and RE for their friendship and continuing inspiration. The Gold Sparkle Band hit New York fully-formed in 1998, and Nu*Soul Zodiac, their third album, documents their breakthrough. Blurring the line between composition and improvisation, GSB move seamlessly from dirges saturated with Messiaen-ic color to full-throttle free playing. The band has a near-telepathic interplay that comes from years of fellowship; multi-reedist Charles Waters and trumpeter Roger Ruzow arc solos across the sky, rising on currents generated by the energy of Adam Roberts' eloquent, muscular bass and Andrew Barker's flood of rhythms. All Horns purchased from and repaired by Charles and Russel Fail at Charles Fail Music, Woodstock, Georgia. Each CD is $13.00 postpaid. Get the Brooklyn Cantos CD with Paypal! Get the Fugues and Flowers CD with Paypal! Catch a complete archived video and audio performance from the folks at Supersphere. Also check out a great show live at WFMU on the Stork Club from January 7, 2001: The Gold Sparkle Band Meets Les Falaises. Charles Waters of GSB, plus French musicians from Les Falaises--a Paris art-collective living in a squat in Montmarte in the north of Paris.